There is a strong correlation between banks and bond yields, as the chart below shows. 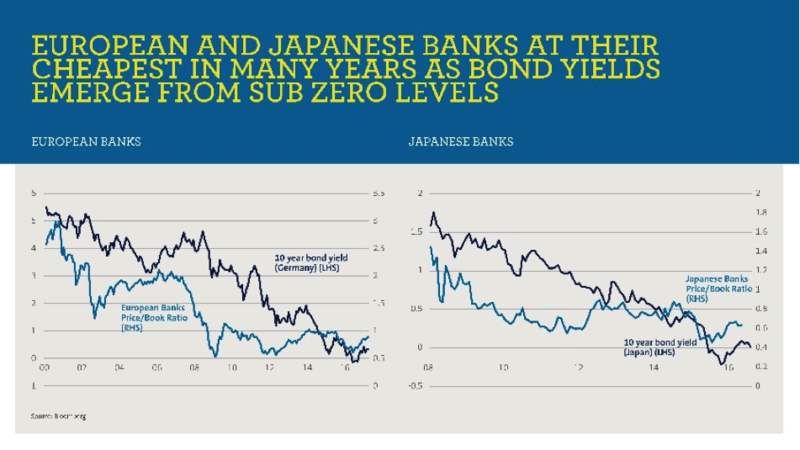 Extreme interest rate policies in Europe and Japan have led to remarkably low yields, and in turn, banks trading close to - or even below - book value. However, with rates turning back up in these regions, banks here are starting to look very attractive. We look at this opportunity in the video below, and discuss how we are deploying specific ETF’s to position for it. Globally, the banking sector has been under pressure in recent years due to zero interest rate policies leading to progressively declining bond yields. Japanese and European banks are particularly exposed due to policies adopted by Bank of Japan (BoJ) and European Central Bank (ECB). A turnaround in rate markets is beginning and banks are starting to follow suit, from some very depressed levels. The Dynamic Market Fund (DMKT) is taking advantage of these opportunities by investing in Nomura NF Topix-17 Banks ETF (JPY) and LYX ETF EURSTX600 BANKS (EUR). Investing in DMKT provides clients with the flexibility to take advantage of global opportunities as they arise.